You can feel and experience the power of a large muscle release and a perfect impact condition. Your power is retained until the last possible nanosecond… then explodes through the ball. You’re back in the hunt and golf’s fun again. One of the great mysteries of the golf swing is the impact position. What if there was a way for you to feel -- yes literally experience a tour quality impact position? What if you could do it automatically and immediately? What if you could simplify your entire swing. Perfect setup position...perfect top of swing position...perfect impact...perfect follow-thru? Hurry up to order with discount 50%! 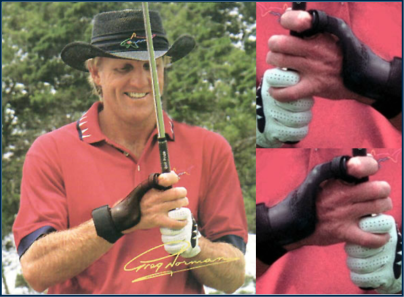 Enter "The Greg Norman Secret "
This simple yet powerful training device slips onto your right wrist.You make your pass. Automatically and instantly, The Secret guides your leading left side into a perfect IMPACT POSITION in the pure pro quality tradition. with a lower, harder, spinning trajectory. You’ll hit shots that will utterly amaze your golfing companions. Our “Greg Norman Secret” makes it all so easy. You drill in the feeling… remove the device… and you now have a new golf swing that is fundamentally sound. And there’s more. We offer you 15 minutes with Greg Norman himself. This DVD features instruction on using the Secret in achieving a more powerful impact position. © MMVII Sports Science Research Institute. All Rights Reserved.